Noam Sobel of the Weizmann Institute gave a talk on olfaction at UniGe this week which was pretty cool. Before diving into his talk, let's look at the big picture. The defining question of olfaction is, how are odors encoded in the brain? (Good God that question sounds obvious.) Is the odor representation sparse or dense: do odours activate many neurons or few; and do single neurons respond to many odours or few? What are the spatiotemporal characteristics of the reponse; does it evolve over seconds or milliseconds; is there an ensemble code? To answer these questions, olfaction researchers have performed the expected experiments: they've recorded from a cell, while presenting a gamut of odors; they've imaged/recorded from dozens of cells, and presented a panoply of odors; and they've sliced the neural responses into bins to see what that tells them. And they all now agree that the odor code is either sparse or dense, and that the spatiotemporal properties of the response may or may not matter. The first paper asks, what is the best way to characterize an odor? From the chemical perspective you can describe odor molecules in terms of chemical bonds, aldehyde groups, etc. And from the human perspective you can describe odors in familiar terms like "nutty" or "rancid." What Sobel's group asked whether there was a correlation between our cognitive descriptors and the chemical properties of odors. To do this he performed principle component analyses* (PCA) on two datasets. The first was on an old dataset of perceptual descriptors of odors made by a guy named Dravnieks in the 80s. Dravnieks sent odor samples to ~150 odor experts (e.g. perfumers), and asked them to rate the compounds on ~150 descriptors from 1-5 (e.g. almond, lemon, sweet, rotten egg). What Dravnieks discovered was that all humans had the same general perception of odor, across cultural and genetic boundaries, which was a big finding in the 80s. * Principal component analysis is basically used to find correlations between variables. The example Sobel used is that the height and weight of a person are both correlated with our idea of "size." If I told you someone was big, you would be surprised if he was short, or skinny. There's a decent intro in this pdf. Or you can Google it. Sobel took these ratings of the odors, ran a principal component analysis, and found that one principal component could explain half the variability of the dataset. This component was highly correlated with ratings for "fragrant, floral, and sweet," and negatively correlated with "sweaty, rancid, and sickening," (panel A below) so he labeled this component "pleasantness." Despite what other descriptors you might use for a smell, the most important thing about it is how much you like it. Sobel then did the same trick on odors' chemical structure. He analyzed a database of 1500 odors which characterized each odor in terms of molecular weight, charge, number of carbon atoms, etc. And he found one principal component could describe 30% variability of chemical compounds. The categorization of this was somewhat more elusive, but this component had some correlation with the weight and density of the molecule, but not very strongly. So far we've learned that we perceptually categorize odors like we categorize movies, as good or bad. The most important chemical descriptor of molecules is not really intuitive. 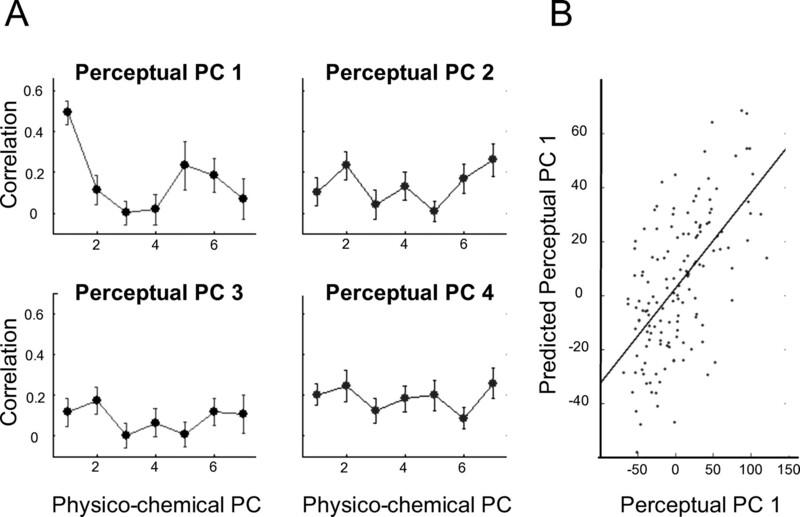 But what's really cool is Sobel compared the first principal components of perception and structure against each other, and found that they are correlated! Something about a chemical, j'ne sais quoi, is able to predict how much we will like an odor. The paper continues with some behavioural experiments to verify this idea, but I leave that as an exercise to the reader. Given the correlation between our perception of odors, it's possible that our neurons are encoding something similar. The second paper looks at this by performing a meta-analysis of twelve papers that recorded from olfactory areas while stimulating with odors. So he did what he do, and performed PCA on the responses, and found that the first PC of the responses was basically the overall neural response (of course, I'm not sure what the other PCs are. Individual cell activity?). There are some interesting exceptions in Fig. B, H, and I, but those are due to special chemical groups like aromatics or aldehydes. I do have a question here as to whether he mislabeled the PC, as neural response is highly correlated with detectability; you can't get a neural response to something you can't detect, but that's just semantics. He did do some controls to make sure odor concentration was not being indirectly encoded here, but that's a detail. This means the odors that we find the most pleasant are the ones that activate our neurons the most. It's almost like our brain evolved to let us sense what's important. Unlike the other analyses, the second PC of activity here was interesting, as it was correlated with odor toxicity. In the talk Sobel described his idea of these components as something like, "The first PC determines whether we should investigate something, and the second determines whether it's ok to eat it." It's amazing what you can discover when you ask simple questions. One big caveat to the results is that while all these principle components are correlated, the correlations are not very strong, usually r~0.4-0.5. This of course cannot account for much of the variability, but considering how diverse the datasets are, it's impressive that anything meaningful can be extracted at all. The other big issue I have is that it seems to be missing obvious categorizations like floral, or acidic, which have both perceptual and chemical meaning. These categories are of course small and exclusive, and may not show up in a PCA because they do not correlate over large groups of chemicals/odors, but they seem meaningful. But, as I said before, I am not an expert on what PCA can bring out of the data, and it seems like Sobel was searching for general principles rather than specific categories. Haddad R, Weiss T, Khan R, et al. Global features of neural activity in the olfactory system form a parallel code that predicts olfactory behavior and perception. The Journal of neuroscience : the official journal of the Society for Neuroscience. 2010;30(27):9017-26. Available at: http://www.ncbi.nlm.nih.gov/pubmed/20610736 [Accessed July 9, 2010]. Khan RM, Luk C-H, Flinker A, et al. Predicting odor pleasantness from odorant structure: pleasantness as a reflection of the physical world. The Journal of neuroscience : the official journal of the Society for Neuroscience. 2007;27(37):10015-23. Available at: http://www.ncbi.nlm.nih.gov/pubmed/17855616 [Accessed April 27, 2011]. Ok, I have to ask. Why are so many people translating this page into Arabic? It's the most read post on my blog.